As Regional Facilitation Unit (RFU) for the ACE II Project, the Inter-University Council for East Africa (IUCEA) leads the implementation of key elements of Component 2 of the project, aimed at building strong and sustainable regional partnerships and collaborations to produce competent Masters and PhD holders for the regional market and improve quality of teaching in higher education, and the quality of production and services in public and private sectors. 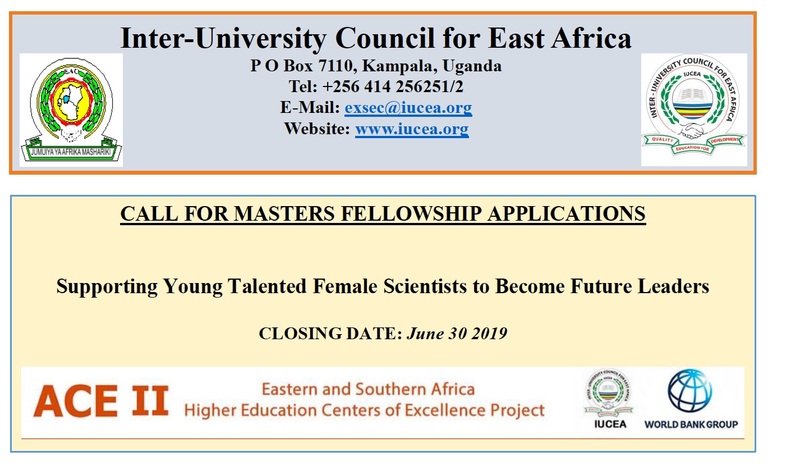 To encourage the participation of young African female students at postgraduate level, IUCEA wishes to implement a Fellowship Program aimed at providing competitive Masters Scholarships to academically deserving future talents to promote regional female student mobility. Eligible female applicants who can demonstrate interest and ability in the priority areas are encouraged to apply for the 30 Fellowships available for the 2019/2020 academic year. Note: Candidates must complete all academic work within 24 months and the scholarship will not be extended beyond this period.